Enhance your Chevrolet Corvette C1's Cove with this awesome looking Cove Graphics kit. These graphics are perfectly shaped to the curved lines of the C1's cove as shown in the picture. They're precut and ready to install in one of four (4) colors! Starting as solid at the front, the graphics fade to your vehicle's paint scheme to the back. 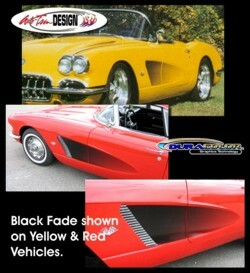 This graphic set will fit on all 1958 thru 1962 C1 Corvettes. Graphics are packaged with one (1) driver side panel and one (1) passenger side panel. This set is very easy to install and includes online general application and care instructions.